Wednesday morning, in the Nevada desert, one of the companies working to develop a hyperloop will deliver a proof of concept—the first full-scale demonstration of the transportation technology that will be able to travel at speeds over 300 mph in an open-air environment, potentially changing the future of transit along the way. What engineers are calling a “propulsion open-air test” (POAT) will be the first public peek at the electromagnetic propulsion system developed by Hyperloop One, formerly Hyperloop Technologies, which released this animation today. The company’s name change, also announced today, will differentiate the two-year-old startup from its competitor Hyperloop Transportation Technologies (HTT). On Monday, HTT made its own announcement that it had licensed a different propulsion technology using passive magnetic levitation. “We’ve tested levitation technologies, we’ve tested the aerodynamics in those low-pressure environments, we’ve tested the tube,” said CEO Rob Lloyd, when I met him at Hyperloop One’s headquarters in downtown Los Angeles, where about 160 employees are working on the project. “So we’ve done testing of all the systems but only can demonstrate this if we build it at full-scale.” At the end of last year, Hyperloop One acquired the land in Nevada to start building a complete prototype, which Lloyd estimates will be ready by the end of 2016. The pods should be able to reach speeds over 700 mph once installed in the low-pressure tubes. Beyond the propulsion tech demo, Hyperloop One also announced a long list of new partners today, most notably the addition of Danish architect Bjarke Ingels and his firm BIG. Ingels, who is known for his ambitious public infrastructure projects, will give some much-needed design direction for how Hyperloop One’s projects might start to integrate with the cities they’re meant to serve. “With hyperloop we are not only designing a futuristic station or a very fast train, we are dealing with an entirely novel technology with the potential to completely transform how our existing cities will grow and evolve, and how new cities will be conceived and constructed,” Ingels said in a statement. Also partnering with Hyperloop One are engineering firms AECOM and Arup, as well as transportation and tunneling partners from Amberg Group (Switzerland), Deutsche Bahn (Germany), and Systra (France). 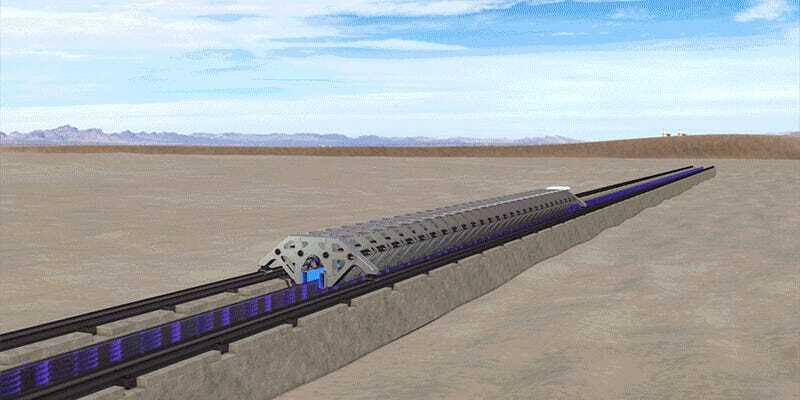 This group of international consultants alludes to the fact that the first hyperloop will likely not be built in the US, but in a country with fewer regulatory restrictions. Among Hyperloop One’s investors are France’s railway system SNCF, which is eyeing hyperloop as a potential replacement for high-speed rail, according to several European publications. Earlier this year, Hyperloop One’s competitor HTT announced a plan to bring a hyperloop system to Slovakia, but the company still has yet to build a planned five-mile test track in Northern California. While the original hyperloop concept was proposed by Elon Musk way back in 2013 as a way to move humans in a manner that might replace flying, Hyperloop One is focusing its efforts on a cargo transport system first, which many people—including myself—have said is a better use of the technology. Lloyd said he hopes to discover these potential case studies with a new call-for-proposals soliciting concepts for how hyperloop could benefit cities. A few of the feasibility studies already underway include a better infrastructural connection between Stockholm and Helsinki, the efficient movement of shipping containers through the Port of Los Angeles, and a tunnel-based cargo transport system for Switzerland. What Lloyd and Geigel both referred to as the startup’s “Kitty Hawk moment,” alluding to the Wright Brothers’ famous first flight, will happen later this year when the full-size hyperloop prototype is ready. But tomorrow, there will be an important first step: the POAT. We’ll provide video of the test when it happens. Update, May 11, 2016, 1:40 p.m. ET: People are arriving at Hyperloop One’s test site. Update, May 11, 2016, 2:00 p.m. ET: Looks like it happened.